Dual Floating Shell Design, Snare Drum from Organic Custom Drums. Organic Drums present their unique, patent-pending Dual Floating Shell snare drums design. Available in several custom options and hand crafted in the USA, these snare drums benefit from an innovative construction which is said to allow them to resonate to their full potential, uninhibited by cumbersome hardware, invasive drilling, and other factors that can limit sonic qualities. Each drum features two individual shells and a central ring made of 32 plies of hand-selected maple. 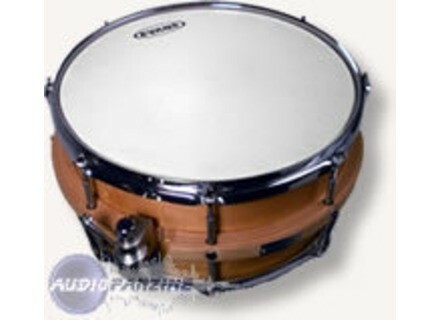 All hardware is attached to the central ring, allowing the shells to "float" within the structure of the drum, which is supposed to enhance the tonal qualities and resonance. According to the brand, this design opens up new opportunities to enhance the sonic qualities and visual appeal of your custom snare drum. 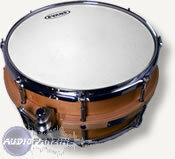 Organic Drums claims to use genuine Keller VSS (Vibrating Sound Source) maple and birch shells made in the USA. Vintage mahogany, oak, and cherry shells are also available, as well as a variety of solid, steam-bent and aluminum shells. The 100% maple and birch shells are available in 5-, 6-, 8-, and 10-ply configurations. Because the floating design places minimal stress on the shells, thinner shells can be used for increased resonance and more low-end range. Mahogany shells are available in 6-ply configurations, while oak and cherry shells are available in 10-ply configurations. Domestic and exotic solid wood shells and aluminum shells are available as a custom option. All solid wood shells come standard with maple reinforcement rings installed. Solid steam-bent shells offer unsurpassed tonal range and rich timbre, and are the leading choice for ultra high-end custom snare drums. A large selection is available, including Birdseye maple, walnut, cocobolo, oak, ash, beech, cherry, and birch. Every drum features 45-degree bearing edges that are precision-cut, hand-sanded, polished, and waxed for optimal head placement and tonality. 30-degree bearing edges are also available, allowing for more head to shell contact for a vintage tone. Each drum comes with the industry-leading Trick GS007 precision aluminum throw-off, top-of-the-line PureSound Custom Series 20-strand snare wires, 2.3 mm triple-flanged hoops, and precision-machined threaded tubes. Hand-rubbed stains are available in your choice of satin or high gloss finish. Custom air-brushed designs finished to your exact specifications are also available, allowing for endless design possibilities. Hardware finishing options include polished chrome or brushed aluminum, black or brass chrome, and powder coating. Choice of either die-cast hoops (for a more controlled sound) or custom wood hoops (for visual appeal and a natural tone). Custom inlays can also be added to your wood hoops, and the center ring can be custmized with a special artword. Yamaha Hex Drum Rack System Yamaha Introduces Hex Drum Rack System. Yamaha BSM-1450 Yamaha's Band & Orchestral Division has announced the new Berlin Symphonic Series Maple Concert Snare Drums. Pro-Mark Stealth Rods Pro-Mark presents the Stealth Rods.